At DKAD, we are advocates of architecture that uses space efficiently and maximizes natural light. For this project, we did exactly that – through reconfiguring the residence’s kitchen and a modest addition, we converted this home into one that feels spacious and cohesive. 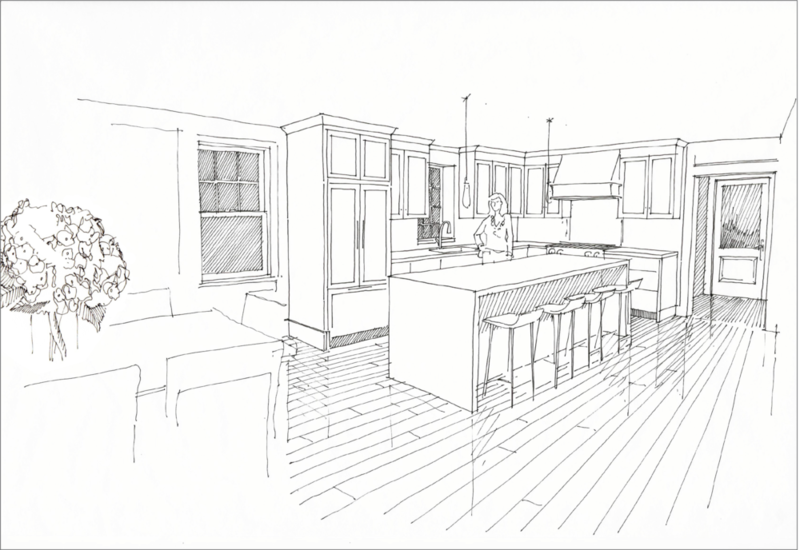 To maximize functional space, we removed the partition between the kitchen and dining room. From the initial concept sketch through construction administration, we were engaged in this project every step of the way. Custom built-in millwork and a statement chandelier bring the dining space to life. Our design incorporated a pantry and mudroom, making sure that every square foot of the home – including these in-between spaces – were carefully considered. Last, we transformed the attic into a home office. Strip lighting installed on the rafter ties provides for warm ambient light, while swing-arm lamps provide focused task lighting.